In the U.K., “brilliant” has many meanings, of which my favorite displays a sort of free-floating irony. The travel-resource application TripIt has a nice use of the word in its upgrade protocol (seen in the screenshot below). 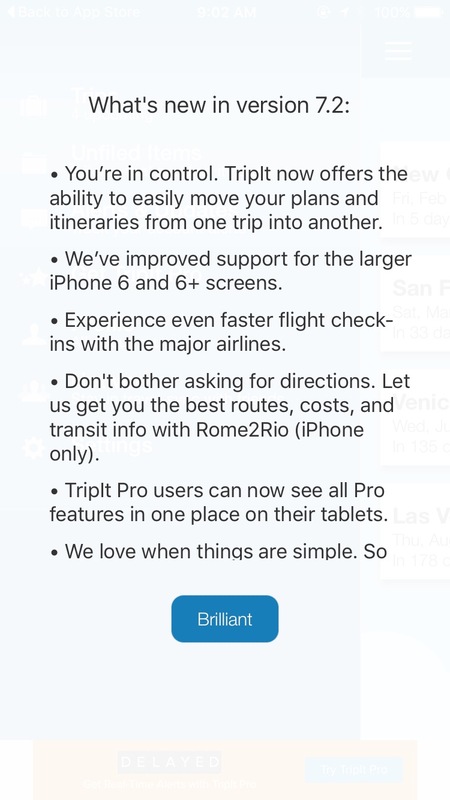 Sometime in the mists of time, it was established that, in anything having to do with computers, you click the word “OK” to indicate comprehension or agreement or just “go to the next screen.” TripIt has come up with an alternative to “OK.” Brilliant. “We love when…” What kind of English is that?